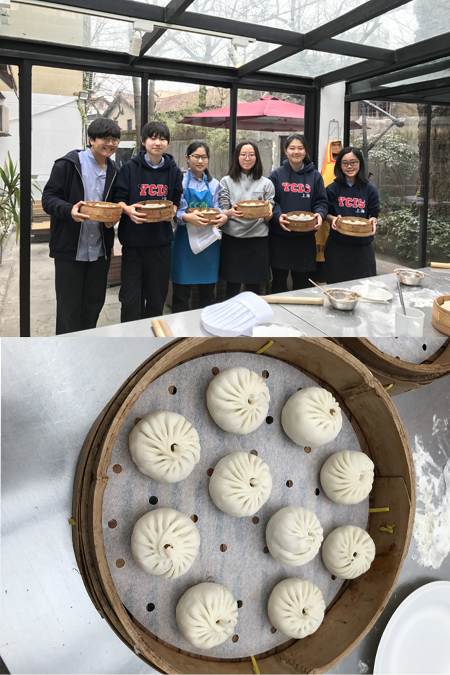 On march 10th, YCIS year 9 CAL-4 students had an opportunity to experience making xiaolongbao. Xiaolongbao is a type of steamed bun (baozi) from the Jiangnan region of China, especially associated with Shanghai and Wuxi. Our classmates went to a workshop where we can experience to make Chinese traditional foods. Teacher who taught us how to make xiaolongbao was called, ‘Wang Shi Fu’ . When we just arrived to the workshop, Wang Shi Fu told us to leave our stuffs in the shelves, take off our clothes and wear aprons. Next we had to wash our hands in the kitchen. Next to the sink, one person was preparing ingredients for the xiaolongbao. After all members of our class had gathered, Wang Shi Fu taught us how to make the dough. First, we had to mix the flour and water. We put about one and a half spoon to 100 grams of flour. After dough was made, we wrapped it with a piece of cling wrap. Second, we put many different kinds of seasonings into bowl of pork such as : Soy sauce, salt, sugar, ginger, green onion, edible oil etc. After we had added all ingredients, we stirred them in same direction. Third, we took out the dough out from the cling wrap and divided into ten pieces. We take each one out and stretch it to be thin enough so that it can be wrapped as xiaolongbao. Everyone got chances to make ten dumplings each. After everyone finished making their own dumplings, Wang Shi Fu showed us how does xiaolongbao get cooked. We waited for about ten minutes until the dumplings get cooked.When we tasted it, we really thought that it was delicious. Especially Wang Shi Fu’s dumplings were delicious. We really enjoyed making it. It was very new and fabulous experience for us. We would like to try it by ourselves again. At YCIS, we recognise the need to assist our Year 9 students transition into the Year 10/11 program of learning. The Year 10/11 program of learning is an important stepping stone on the pathway to the IB Diploma program and presents a number of challenges that students must face, the most immediate of which is choosing which of the optional subjects they would like to study over the next two years. To help with this decision making process, a number of activities and events have been conducted. Back in December, an information evening was held focussed on the transition program that YCIS was putting in place for our Year 9 students. Key elements of the transition program are trial Year 10 type lessons in the optional subject areas, an information session on how to support students taking the Year 10/11 program of learning, a curriculum information evening held in March and opportunities for parents and students to meet with the Coordinator or University Guidance Officers to discuss their proposed learning program. 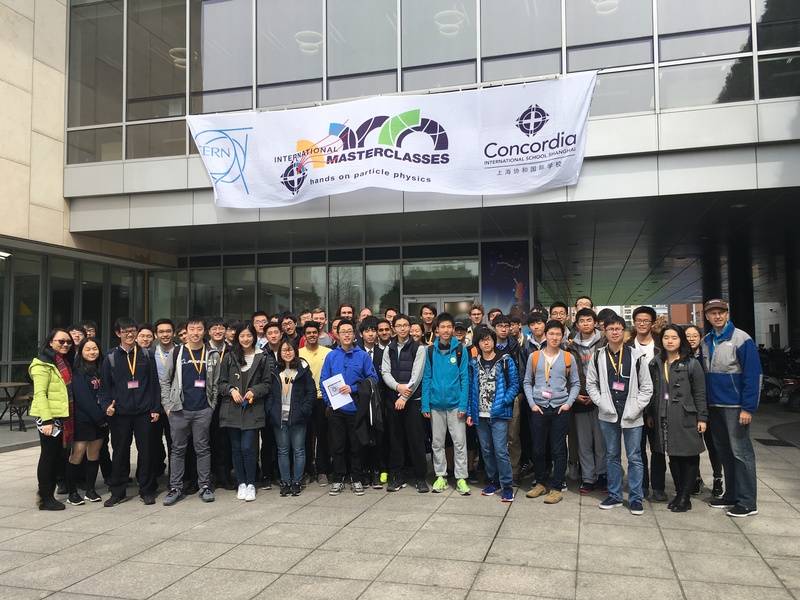 The Year 13 Physics students attended a Particle Physics Masterclass held at Concordia on 17th March. 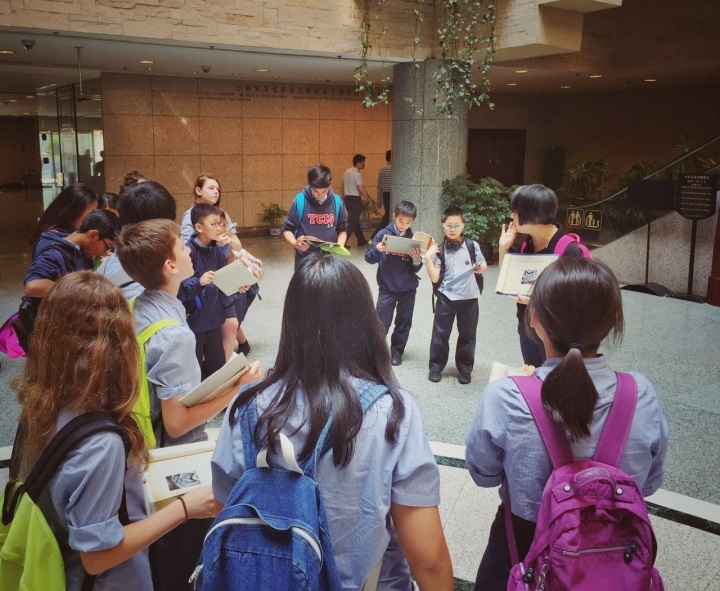 In the session, they had a chance to revisit their basic knowledge of Particle Physics as well as learn more about the Large Hadron Collider, the most sophisticated machinery ever built in Science. An activity which required them to form hadrons, led them to discovering the rules behind the combination of quarks. They then had to calculate initial rest mass of particles from the energy and momentum of the resultant particles that were produced from a collision. To end off the session in the classroom, they were taught to analyze actual collisions made in the LHC. To end off the day, students were brought on a tour of the Shanghai Synchrotron. They were given a chance to look at some of the experiments that are currently being carried out at the facility. 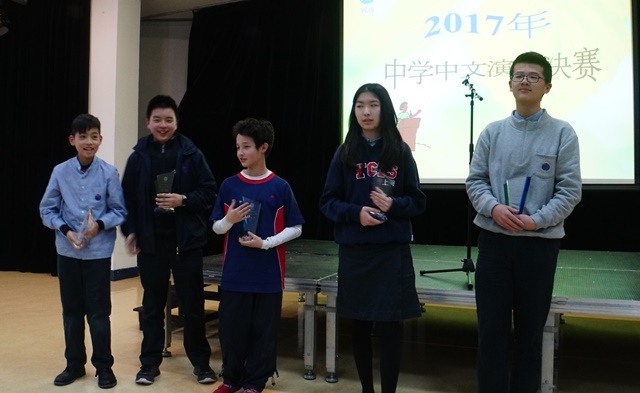 On 14 March, the annual Chinese Speech competition successfully came to the end as scheduled. The themes of this year’s competition are “…… and me ”. The candidates shared plenty of their interesting personal experience, feelings and inspirations. The results are as below. Throughout the Chinese speech competition in 2017, I was very excited and the messages in these speeches were very meaningful and I was very moved by them. One of the most memorable speeches was the one with a boy and his dog. Sadly, his dog died and I was very moved and this created a very sad mood in the audience personally, I have never had a dog in my life, but I hate the fact that this person lost such an important person in his life. The person giving the speech said that his dog was his pal and that he would always remember his dog. I was very touched by his love and friendship towards his dog. Overall, this year was very exciting for me especially, because for once one of my friends was actually on-stage. My friend is a hard-working student, but his Chinese background is not very good, so when the teacher announced that he would go into the speech competition, we were all very surprised. His ideas are excellent and we all understand his thoughts, but he has a difficult time expressing them. We all cheered him on, and soon he was up and ready to go. The Chinese teacher was also very supportive and helped him with his vocabulary and he was soon very confident. Even now he can still remember his speech from heart and sometimes recites it in class. The topic in these speeches is “____ and I” and was very interesting, I was looking forward to these speeches to see what they had to say. Learning lots of meanings in life, these speeches made me think about the things that I have and that I have to appreciate the fact that I have such great friends and such a great family, and that I should be grateful that I have such a joyful and awesome life. 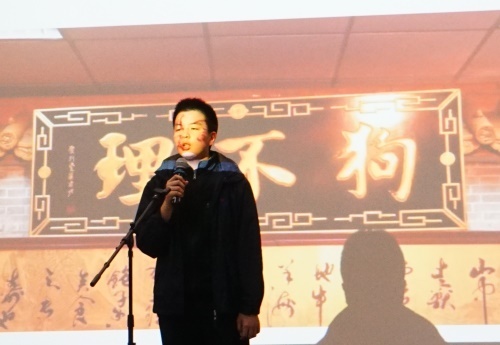 Generally speaking, as part of the audience, the Chinese speech competition has been a great experience and I would like to see more of this contribution in the Chinese department to the school. This experience has not only been emotional but also very exciting as well. It has been thoroughly enjoyed by me, and I believe that many others had enjoyed it as well. 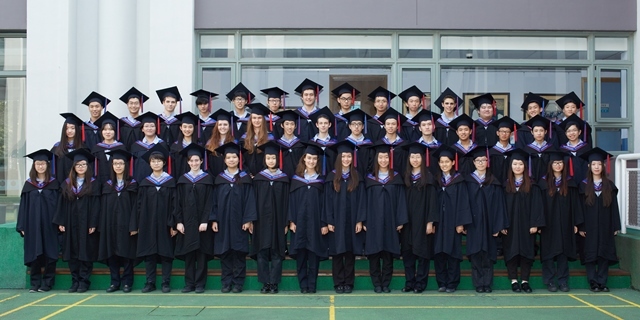 YCIS Shanghai consistently scores very well on the International Baccalaureate Diploma examinations, and the Class of 2016 was no exception! With 45 students completing the YCIS Diploma, 34 students registered for the IB Diploma and 11 students completing certificate courses, out of a possible 45 points, students need at least 24 points to earn the full IB Diploma. All students who attempted the IB Diploma succeeded giving the school a 100% pass rate. The average score was nearly 36 points, well above the world average of 30. Nearly 20% of students earned 40 or more points. The average grade for our IB Diploma students was an impressive 5.3 out of 7. 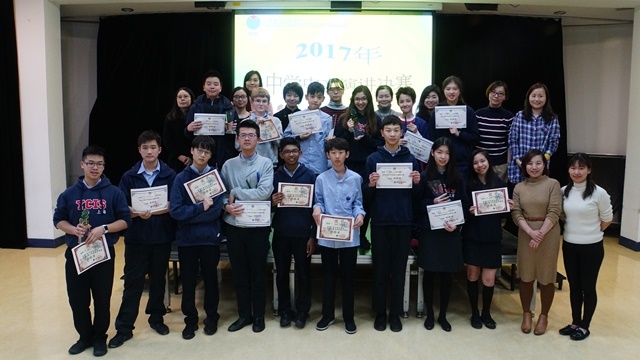 Of great significance for our English and Chinese language learning programs and in line with the school’s Philosophy and Objectives …this year, 53% of our IB Diploma graduates were awarded bilingual diplomas, demonstrating fluency in at least two first languages. Successful completion of the IB Diploma Programme allows students to attend prestigious universities around the world. The Class of 2017 have already received acceptances to a wide range of schools, including Oxford University (UK), New York University, Georgia Tech, HKUST, HKU, University College London, University of Durham, Bath University, University of British Columbia (Canada), University of Pennsylvania (US), University of Toronto (Canada), among others. The Class of 2016 are currently studying all around the world, (University of Chicago, University of Michigan, New York University, Oxford, University of Toronto, HKU, HKUST, Bocconi, Leiden, University of Melbourne among many others). 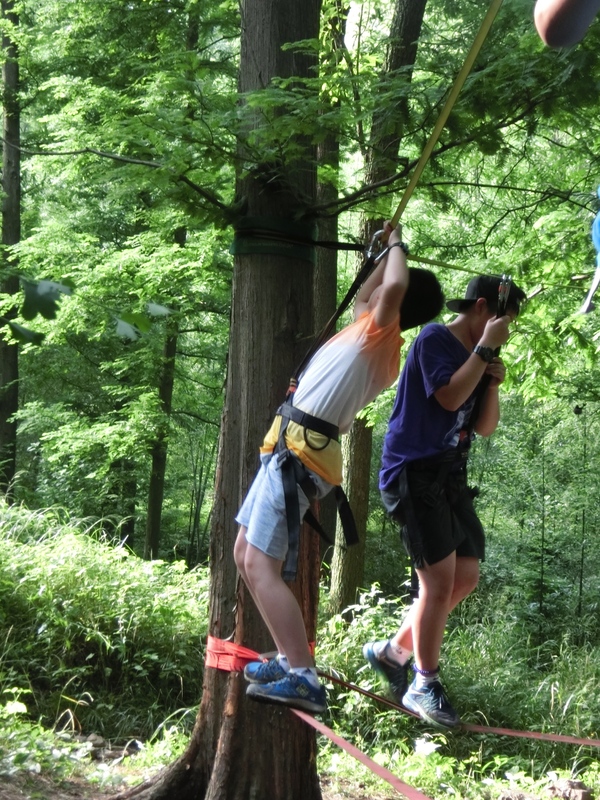 In addition to coursework, IB Diploma Programme at YCIS has several exciting events that students look forward to. The most significant of these for most students is the Year 12 Thailand trip. 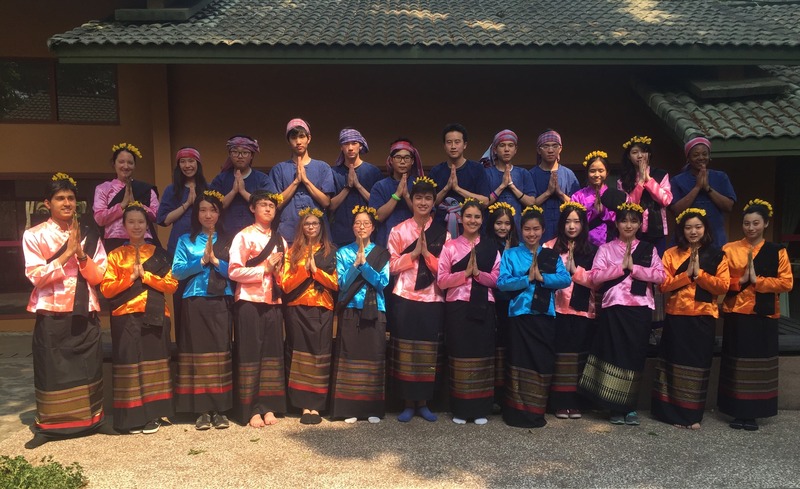 Students spend two weeks at the Traidhos Centre in Chiang Mai. Several days involved science and geography fieldwork, taking advantage of the lush green nature around them. They also complete a two-day leadership course. 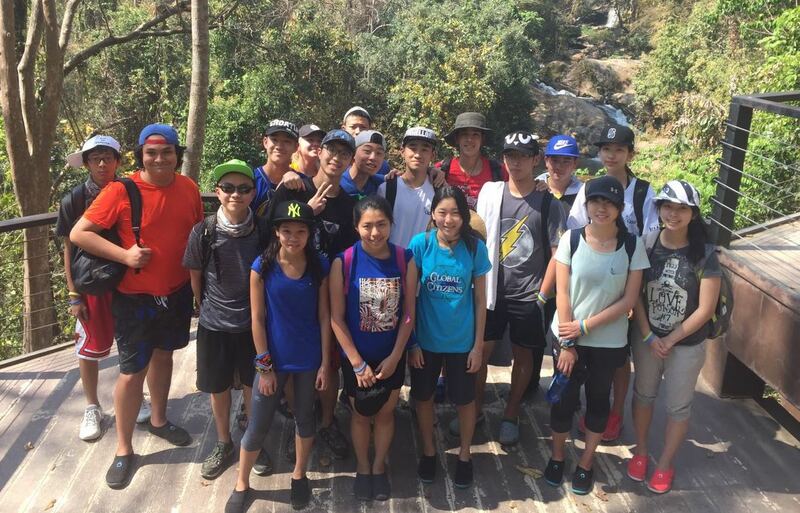 A variety of service projects include working in a hill tribe village and refugee camp and they complete a wide range of activities, including bathing elephants, zip lining, a strenuous day-long hike, and rock climbing. Students learn about Thai culture and Thai cooking. The current Year 12’s have just returned from their Thailand trip –feel free to ask them to cook for you! A big focus of recent times has been the transition of students from Year 9 into the Year 10/11 program of learning. 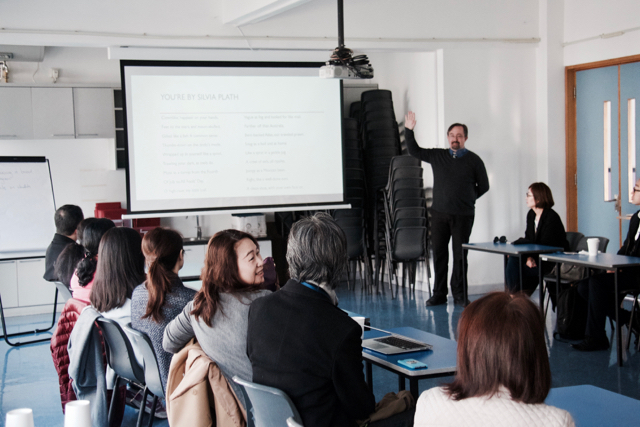 Parents and students have engaged in a number of events designed to allow them to explore the options available to them in the Year 10/11 program and to understand the nature of this next phase of learning. 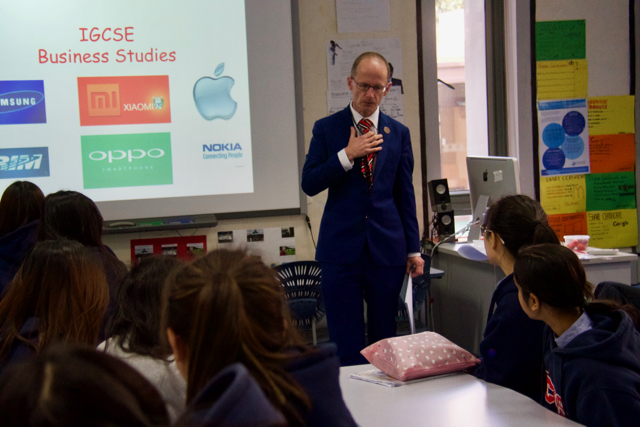 On February 28th, all Year 9 students had the opportunity to experience a little bit of life as a Year 10 student through mini-lessons in a selection of the optional subjects available for study. This event was well received by all and helped clarify several points of uncertainty for students. Coming up, there will be a curriculum information evening at which parents and students alike will be able to talk with teachers about their learning areas and this will be followed up by one-to-one consultations with either a University Guidance Officer or the Year 10/11 Coordinator. Given the importance of this phase of learning in shaping choices for Year 12/13 and beyond, we are working hard to ensure that the choices made by our students are right for them. For the record, our 73 2016 IGCSE students were impressive with 48% of students achieving A*-A with over 90% achieving a grade between A*-C. Nearly 40% of students received an ICE award with Distinction and another 55% received awards with Merit. 23.3% of students received 5 or more A*s with three students receiving 8 or more A* and one student received 9A* and an A. 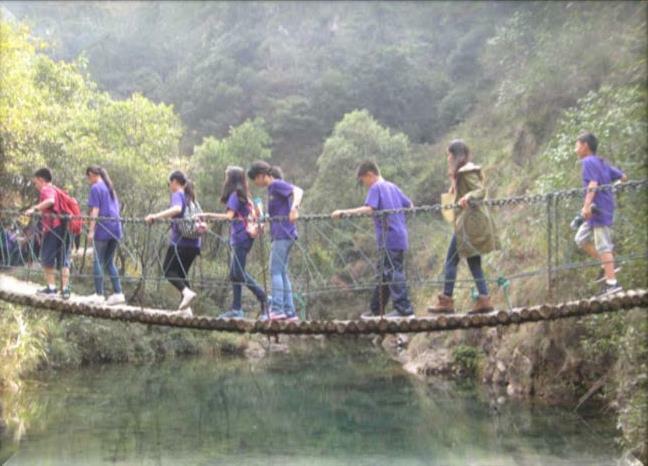 As part of their CAS studies, seven enthusiastic IB students offered to teach at a migrant school on the outskirts of Shanghai with the Charity Stepping Stones. The Year 12s first attended a 4 hour teacher training session organised by the Stepping Stones charity where they learnt about lesson structure and creative teaching strategies. The following week they used these skills to teach the topic of ‘places to visit’ and really enjoyed helping the 7-9 year old students they met at the Migrant school. They will continue to visit the school each fortnight and work on key vocabulary in a fun way! Their next step is to recruit more student teachers and raise funds to provide teaching resources for Migrant Schools across Shanghai. This is a fantastic example of a CAS major project and I look forward to hearing about their future experiences. 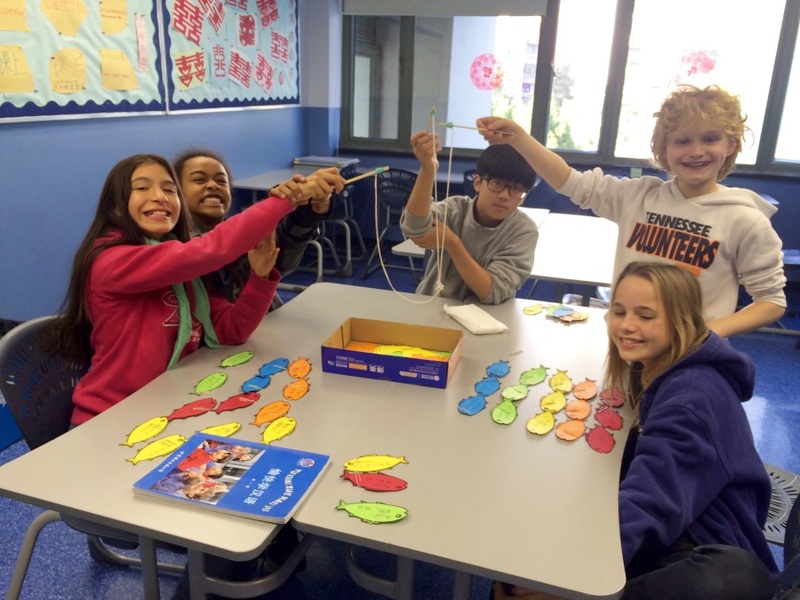 As part of the YCIS Gubei After School Activity Program (ASAP), several IB CAS students have offered to share their personal hobby or interest with the younger students including Christmas Crafts and Sports Club. 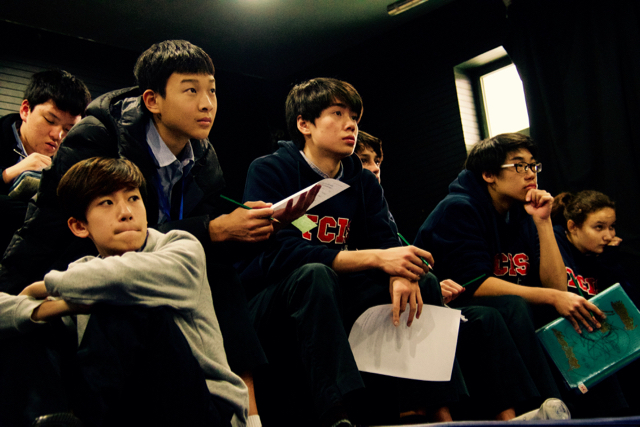 It is great to see the students from lower secondary getting the opportunity to learn from their older peers. Year 9 and 10 students participate in the ACAMIS Cultural Convention, a 2-day extravaganza of creativity hosted by Suzhou Singapore International School. The convention offered a wide range of workshops from Molecular Gastronomy to Taiko drumming, during which students engaged with new ideas and new friends from other schools. Our students developed their skills by; playing drums in a jazz band, making a stop motion animation video, creating self portraits using layering techniques, challenging preconceived ideas of food by making rocket pasta and popcorn juice, practicing aspects of fashion, styling and presentation. The convention ended with a showcase which highlighted the creativity and engagement of the students. 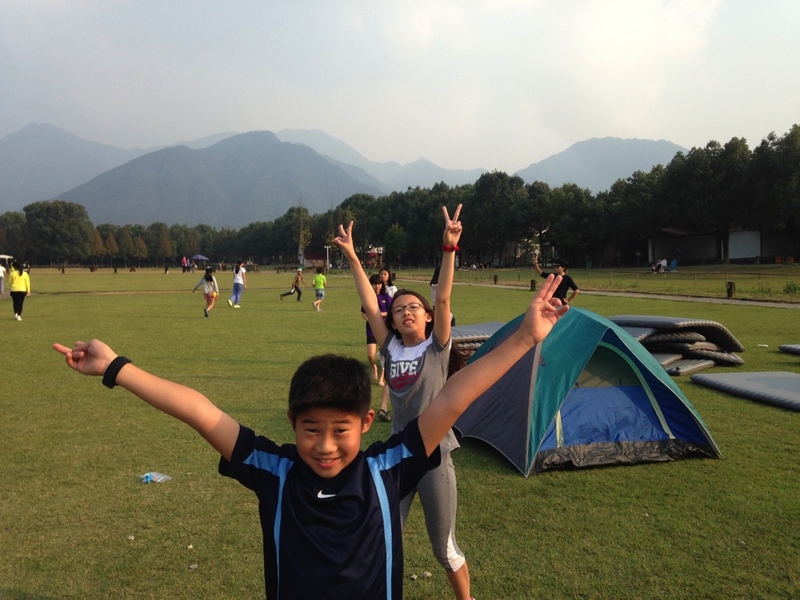 A new CISSA sport, Ultimate Frisbee, saw the students turn into a talented, communicative team with great attitude. What a privilege to coach these young players! Congratulations to Alvina Chen and Chika Minuta for hosting the Winter Formal on Friday 9th December. They created the event as part of their CAS studies and hoped to bring their peers together for an evening of fun, food and dancing, the evening was a big success and everyone looked great in their best formal clothing. For Giving Tree 2016, a group of Year 7-12 students travelled to come Double-Joy Primary school. We spent weeks organizing the giving tree bags, running from homeroom to homeroom, giving speeches in the cafeteria and assembly time to encourage the students to donate or fill up a bag for the children at Double-Joy Primary School. Once our YCIS representative group came to the primary school, we were overcome by the joy and happiness of the children, as they stared both at the gifts, and our western faces. The children were shouting in delight, and seeing their smiles widen as they opened their gift, opened our hearts. When the idea to host an art gallery and auction to support the Sonflower charity came to mind, we had no idea that it would have such a huge impact on us. The auction was an incredible success, full of Christmas spirit, joy and energy. We exceeded our expectations by selling all our pieces, earning around 10,400 RMB in funds for the children of Sonflower. The YCIS Gubei Charity Volleyball Tournament witnessed 12 teams competing in the gym afterschool for, perhaps, one of the greatest volleyball tournaments ever. Combining skill, teamwork and pure power, 36 players clashed in an epic battle royal to determine the one and only Ultimate Volleyball Warrior. After an hour and a half of sweat, blood and tears, the victors where decided! In a breathtakingly amazing final match, Team BEASTMODE, led by Captain Antoine Chaudet, left the court victorious, picking up a trophy as an emblem of victory. The event raised over RMB 1300 for the BaoBei charity! 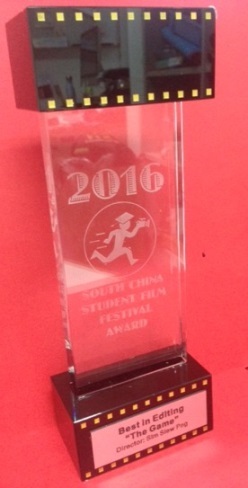 Congratulations to Siew Png Sim from Year 12 who entered the South China Student Film Festival 2016 (SCSFF) held at the International School of Dongguan and won ‘Best in Editing’. 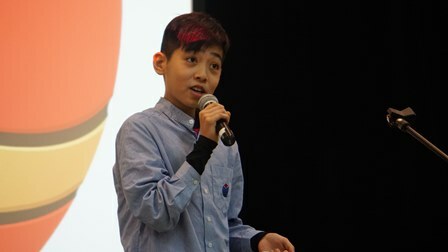 With the help of his friends, they explored the streets of Shanghai to make an innovative short film based on a short story Siew Png had written. The video shows excellent maturity and an fantastic eye for detail. Promote relationships among peers, environment, community and educators. Promote understanding of their host country, and lead to increased cultural respect. • Enjoying the Y7 Chocolate factory visit – Looking into batch production and tasting chocolate along the way. Also making their own chocolate bars! Students have a daily Chinese class in addition to the weekly Chinese Studies. They study different topics for different levels extending from basic daily communication to cross-cultural competence from an international perspective. Teaching and learning involves a range of multi-media presentations, field trips, role-play competitions, interviews, book making, technology integration, etc.